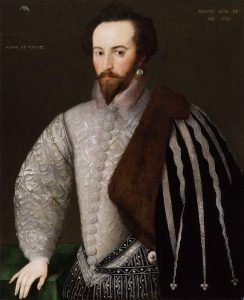 2018 marks 400 years since the death by execution of one of the most remarkable men of Shakespeare’s period, Sir Walter Raleigh. 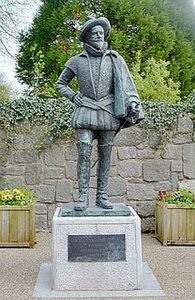 Raleigh is popularly known for bringing back the first potatoes from Virginia, for popularising tobacco, and for placing his cloak over a puddle about to be trodden in by Queen Elizabeth. However there was much more to him. He was a soldier, explorer, courtier, royal favourite, poet and writer of distinction. He retained his connections with the West Country all his life. 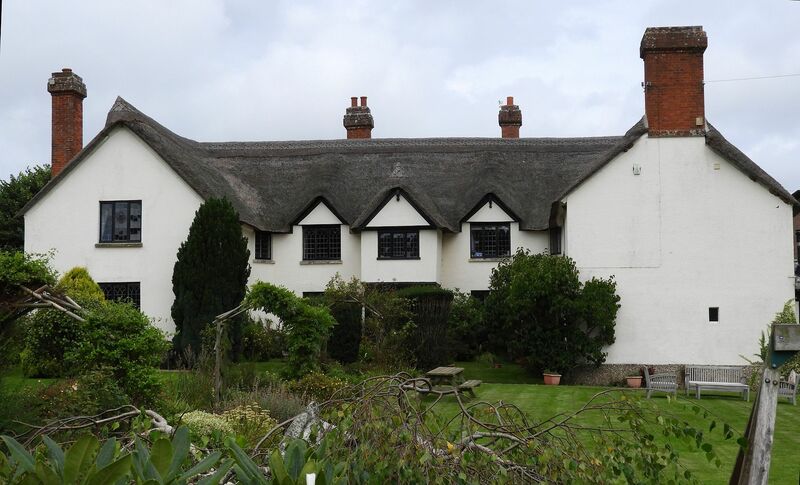 He was born at Hayes Barton, a farmhouse near East Budleigh in Devon, probably in 1554. The house is almost unchanged since the Elizabethan period, standing about a mile out of the village along a narrow country road. Locals are proud of it: the house is not open to the public but there’s a decorative sign outside. In the village itself is the house where he was educated and the parish church contains several ancient carved pew ends including one of the family’s coat of arms and another depicting a sailing ship. This now-tranquil village was in Raleigh’s time a busy trading place, the River Otter still being navigable. He is commemorated by a statue in the village and the sign for the Sir Walter Raleigh pub shows the “cloak moment”. An ambitious, energetic man like Raleigh had to leave East Budleigh. He seems to have spent his early years fighting in the Low Countries, at Oxford University and suppressing rebellions in Ireland. The Queen rewarded him with a knighthood and granted him a royal patent to explore Virginia, paving the way for future English colonisation. He must have shown extraordinary confidence and charisma, and as well as being a man of action he also wrote poetry. Later he still felt “fidelity towards Her whom I must still honour in the dust”. In the illustration of Elizabeth 1’s funeral procession in April 1603, Raleigh is shown as the Captain of the Guard, leading the Guardsmen. When James 1 arrived to succeed her, Raleigh, known for his closeness to Elizabeth, was almost immediately accused of plotting against James 1. He was sentenced to death and sent to the Tower of London, though the sentence was later reduced to life imprisonment. Raleigh remained in the Tower until 1614 when James sent him on a mission to find the mythical El Dorado. Inevitably he failed and Raleigh came into conflict with the Spanish. James needed no further excuse to reinstate the death sentence on Raleigh that was carried out on 29 October 1618, a poor reward for years of devotion to the crown and a distinguished career. This poem, Nature, that washed her hands in milk, reflects on death and the loss of reputation. He fell by the arts of those enemies whom his arms had subdued. During 2018 the main celebration in East Devon will be an exhibition devoted to Raleigh at the Fairlynch Museum in Budleigh Salterton. The star attraction will be Sir John Everett Millais’s painting The Boyhood of Raleigh loaned by Tate Britain. This became one of the most famous paintings of the 19th century after it was exhibited at the Royal Academy in 1871. It shows the young Raleigh with his half-brother Humphrey Gilbert listening intently to a sailor’s exciting stories of his adventures. The painting is set on Budleigh Salterton’s pebble beach, opposite which Millais was living. Also on show will be armour, weapons and domestic items on loan from Exeter’s Royal Albert Memorial Museum and private collections. One of the most treasured items will be a pair of embroidered kid gloves associated with Raleigh. The exhibition will be on from 28 May to 31 August 2018. This entry was posted in Legacy, Shakespeare's World and tagged Bicton Park, Budleigh Salterton, East Budleigh, Edward Millais, Hayes Barton, Queen Elizabeth 1, Sir Walter Ralegh, Sir Walter Raleigh, The History of the World, Tower of London, Virginia. Bookmark the permalink.